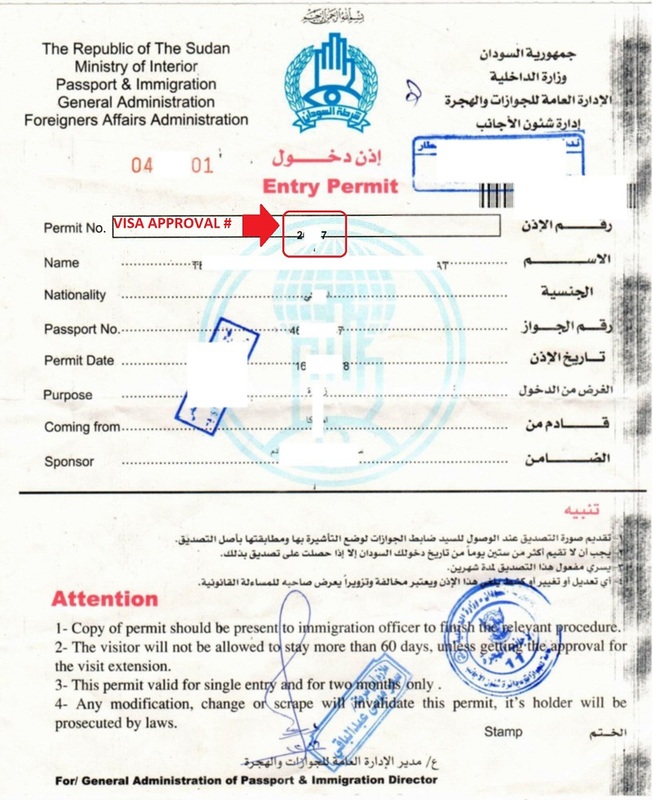 There are several different types of Visas required to travel to Sudan. The most popular include a Tourist Visa and Business Visa. Please click compare visas to make sure you're applying for the correct type of Sudanese Visa. The Sudan tourist or business visa can be valid from eight (8) days to three (3) months. Extensions of periods of stay in the Sudan may be done through the Passport, Immigration and Nationality Office in Khartoum, Sudan. Please note: Your passport must be free of Israeli visa stamps or markings. The Sudanese Embassy will not accept your application if your passport indicates travel to Israel. Visa Approval: from the Sudan Ministry of Foreign Affairs is required. The visa approval should be obtained on your behalf by a relative/friend, sponsoring company or organization, business partner or joint venture in Sudan. Visa Approval can also be obtained by an approved hotel/travel agency in Sudan; please visit www.sudan.net for the list of hotels and travel agencies who can assist with the visa application process. The applicant should plan their travel carefully as the waiting time for the approval and visa can be 4-8 weeks. Once the Visa Approval is received by the Embassy the processing time is approximately 5 business days. Please complete, and print the Sudan visa application form. The application form must be signed. Incomplete or unsigned applications will delay the application process. You must provide your visa approval number obtained by your tour company. This approval can also be obtained by your friends/family, sponsoring company/organization or local hotel in Khartoum, Sudan. Sudan Visa Approval- Sample Letter. The following are Tourist Visa fees to Sudan for the Washington DC Embassy. If you need to find which consulate or embassy is correct for your state of residence, click here. We expedite your Sudanese Visa with the Washington DC Embassy. We verify your application for accuracy before submitting it for processing. When your Sudanese Visa is ready, we ship it back to you using our expedited courier. Our team gets your Sudanese Tourist Visa quickly, keeps you informed every step of the way, and gets your Visa in your hand with plenty of time before your scheduled departure.